Because we don’t have any other choice, we spend much of our learning time studying college coaches. With their small groups and biomotor geniuses, they can (and must) spend the bulk of their time refining their technical and energy system progressions in practice. And, make no mistake, I steal their stuff early and often. But, at the HS level, we’re going to see better overall results not by getting cute with our workouts, but by running more efficient and organized programs facilitating greater skill acquisition for each individual athlete and for the group as a whole. Here are a few ways to get more done in less time. At last Monday’s practice, we reviewed/learned Wall Drill, ‘A March’ and 10m Accelerations as part of our ‘technical development’. In the past, I would teach these drills until I (somewhat arbitrarily) decided they were done. Because I 1. talk too much, 2. have a team full of hot messes and 3. give too much feedback, this could drag on forever plus one day. Because early season practices require more instruction and therefore run longer, I had a lot to accomplish in the session and I didn’t want kids’ eyes to start glazing over any more than usual. So I allotted 20 minutes to get all three drills done. I lined my watch up with my assistants’ so that we all finished at exactly the same time. If you have two weeks to complete a task, you’ll take two weeks. (Well, I will.) If it’s due on Monday morning, you’ll do it Sunday night. But, you can’t color between the lines if there aren’t any. Knowing I had only 20 minutes forced me to be concise in my explanations and demonstrations, give less feedback and go on only one tangent about the true nature of reality. Taking this approach gives your practice more structure, prevents kids from cooling down or getting distracted and allows you to get more done in less time. 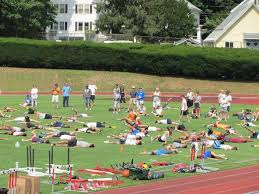 At this past summer’s Complete Track & Field Clinic, we rotated groups of kids through different stations containing separate, but related activities as opposed to having large groups doing the same thing. Coach A teaches ‘A March’ three times in a row. Coach B teaches ‘Wall Drill’ three times in a row. Coach C (or a Captain or team leader) teaches 10m accelerations three times in a row. The kids will all do the drills in a different order, but you just spin your instruction for that group to build on what they’ve already done. Rotating groups allows you to work with/assess every athlete, get more experience teaching specific skills and the continuous change of voice and scenery makes the practice feel less redundant and stationary for your athletes. MORE INFO: Discover all the drills, exercises and workouts you’ll need to run an effective HS sprints program. If you have a large team and a small staff (especially if you coach multiple event groups) kids are going to have to train on their own. You can’t be everywhere at once. Deep down, many of your athletes want to be in a position of leadership. If you prepare, support and empower them, they’ll thrive in that role. Their work ethic, performance and confidence will greatly improve as a result. Your captains and upperclassmen have been around. They know how to teach the basics of Wall Drill or ‘A March’ or Run-Run-Jumps, etc. They probably know it better than 75% of coaches who actually get paid to run a team. So put them in charge of the general stuff while you’re doing whatever you have designated as the part of practice that requires your presence. Now, if they’re teaching basic stuff to the underclassmen, they’re going to learn it better through the act of teaching, demonstrating, answering questions and providing basic feedback. Underclassmen learn the fundamentals without you having to teach the same boring crap for the millionth time. The tradeoff is that they get less reps for themselves. So I reward their sacrifice by giving them the limited individual attention I have time for. Work these ideas into your program and you’ll be pleased with the results. As always, post your questions and ideas below.